The Treasury Department's inspector general's office is launching a second investigation into Steven Mnuchin's government travels after discovering it had not received a complete and accurate account of the secretary's flight information, a government official told CNN on Tuesday. Treasury's inspector general counsel, Rich Delmar, told CNNMoney the oversight agency will be requesting additional travel records from Treasury. Delmar said the agency learned Treasury had not provided an accurate portrayal of a trip Mnuchin took to Trump Tower in New York on August 15. "The OIG has asked for follow-up information to assure that we have in fact received all relevant records," Delmar said. The day trip by Mnuchin cost taxpayers $15,000. In a statement Wednesday, the Treasury Department disputed that the inspector general's request constituted "a second review." "The Inspector General has asked us for additional documentation relating to the Secretary's commercial flight to New York City, and we intend to cooperate with that request promptly," a Treasury spokesperson said. The travel records provided by Treasury to the inspector general had not specified that Mnuchin had taken a commercial flight to New York's LaGuardia Airport from Washington D.C. for a meeting with the president at Trump Tower. Instead, the IG's report said Mnuchin had taken off from the Andrews Air Force base in Maryland on a C-37A military jet and flew 179 miles to Teterboro Airport in New Jersey. Transportation Secretary Elaine Chao and budget director Mick Mulvaney joined him on the way up, according to the report. 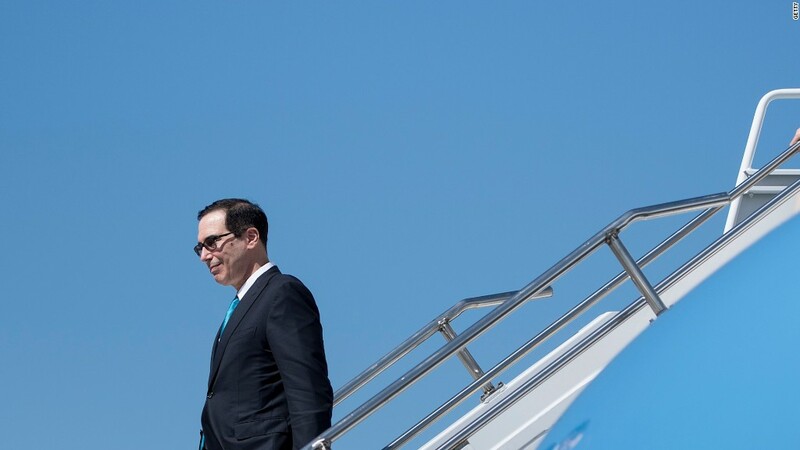 But earlier on Tuesday, a Treasury spokeswoman told CNNMoney that the secretary had flown in a commercial airplane to New York -- a detail that was not included in the IG's report. The IG's office said it didn't learn about the discrepancy until CNNMoney called seeking further details of Mnuchin's trip to New York. "I realize that wasn't clear in the report, so I wanted to clarify," a Treasury spokesperson wrote in an email to CNNMoney Tuesday. "The Secretary flew commercial up to NY and milair back as he needed access to secure communications." The IG's Delmar said news of the commercial flight came as a "surprise" after he asked Treasury about the matter. "I sent an email to the general counsel saying, 'This wasn't in the material you gave to us,'" said Delmar. Citing Treasury spokespeople, ABC News first reported that Mnuchin flew to New York on a commercial fight on Sept. 22. Mnuchin's return flight from New York was one of seven he completed on military jets. It was detailed in a report released Thursday by the Treasury Department's inspector general. According to the report, Trump requested that Mnuchin join him that day at Trump Tower in Manhattan to discuss tax reform and tariffs. The meeting was initially scheduled for Bedminster, New Jersey, where the president has a golf property, but was later relocated. Updated: This article has been updated to add a statement from the Treasury Department.